Enter the appropriate info (e.g., Fixed code, VASPID, VASID, Telematics, Return URL, etc.) then click Add. 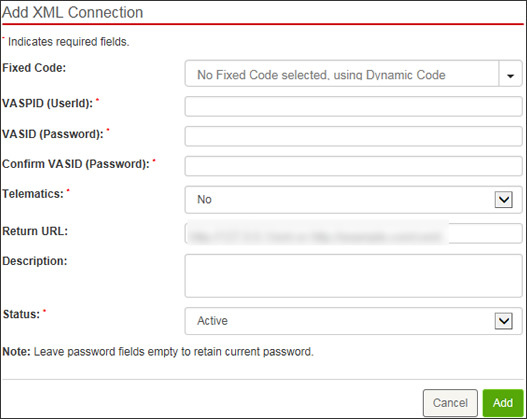 Authentication for XML connections in EMAG is done based on the incoming IP, VASPID (userid) and VASID (password). 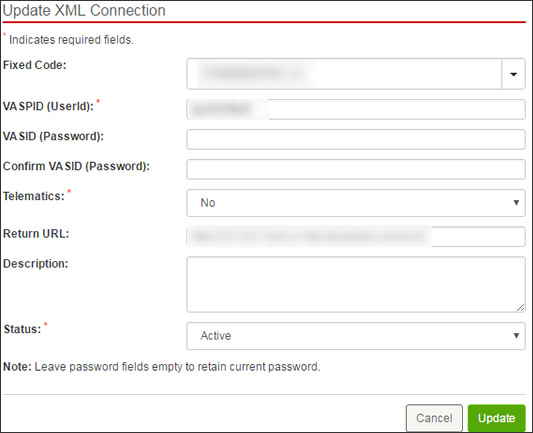 From the XML connections screen, click the desired XML connection Userid (located on the left side). Modify the settings (e.g., Fixed code, Userid, Password, etc.) as desired then click Update. From the XML connections screen, locate the connection then click Remove icon (far-right).